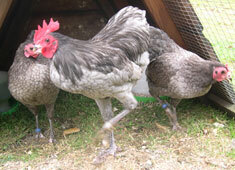 Langshan hens lay three medium to large brown eggs a week. They lay into the winter months and usually average 150 eggs per annum. Langshans mature slowly as layers and meat producers. At twenty four weeks they dress out at seven pounds. They produce a good quality meat, but their shape lends itself more to a roaster than a fryer. Langshans can easily clear a six foot fence. The breed tolerate extremes in temperature from 100 degrees Fahrenheit to subzero. 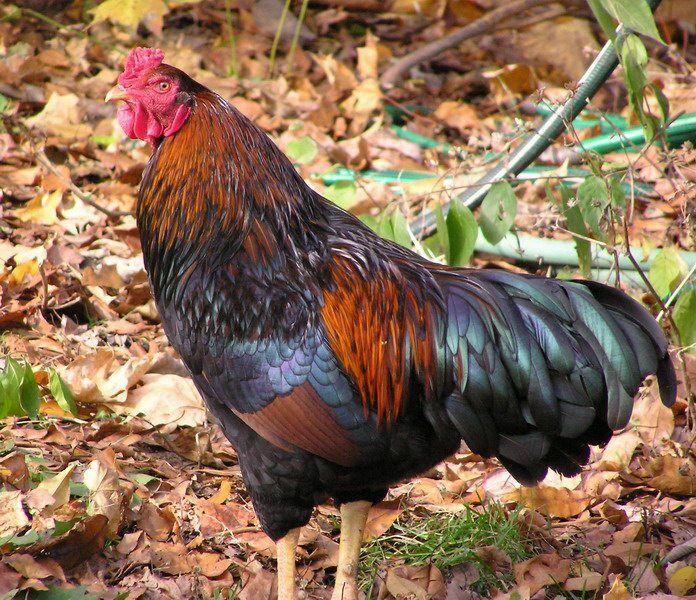 Langshan roosters can stand twenty-four inches to thirty-two inches tall. They rank as one of the tallest and lightest, non-game Asiatic breed in the world. Their tall, regal deportment translates well in the show ring. Langshans also have a sixteen inch, erect, tail. The American Poultry Association recognizes three varieties of Langshan chickens: Black, White, and Blue. 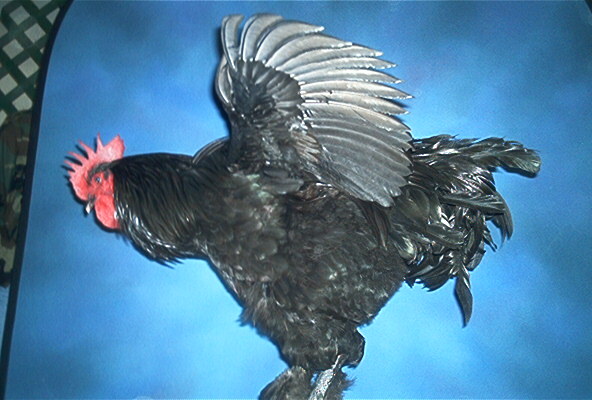 Black Langshan, the most common configuration, has black feathers with a green sheen. 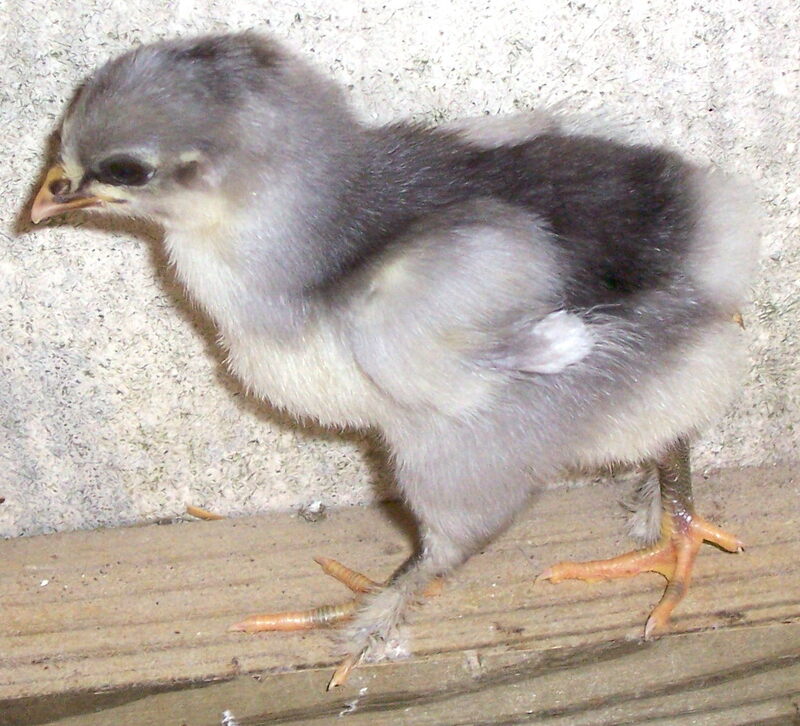 They stand on black feathered, bluish-gray legs and feet. Their medium-sized, bright red combs, wattles, and earlobes stand out against their very black plumage. Change the black feathers to white, and you get the White Langshan. The very rare Blue Langshan comes from crossing the Black and White Langshans. Major Croad imported Langshans from China to England in 1872 where they eventually took on the name Croad Langshan. In England the breed developed along two lines—the Croad and the German Langshan. In 1876 Croad Lanshans arrived on the North American continent. 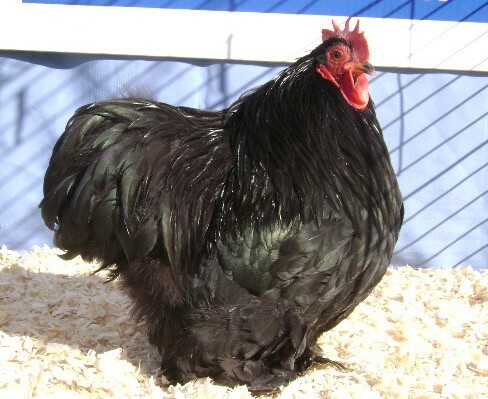 By 1883 the American Poultry Association accepted the Croad version of Langshan but called it the Black Langshan. The APA admitted the White Langshan in 1893 followed by the Blue in 1987. Both the White and Blue Langsshans come from the Croad lineage. Although the German Langshan continued in England and Germany, it failed to catch on in the US . 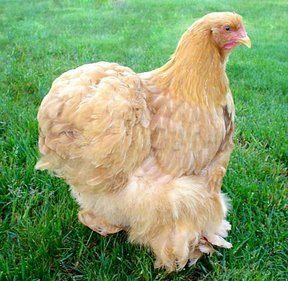 Langshan chickens, a dual purpose chicken in the 1900’s in America, now lives primarily as an exhibition fowl for most owners.